Parents can securely pay for school items online at a time convenient for them. Send payment alerts or school messages by text or email to parents. 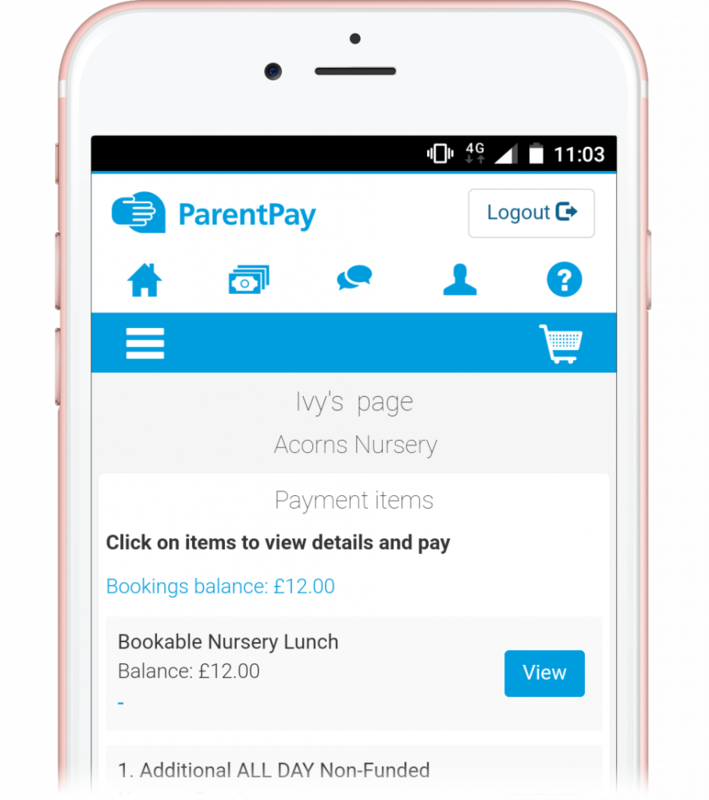 ParentPay includes a communication system so the school office can easily send out important information and updates to parents. Funds are settled accordingly on a weekly basis. Income can also be split between central and local banking. Online payments are immediately credited to the relevant account and can then be allocated directly to the school or the caterer. Central control, banking and reporting across schools. Income reports provide high-level financial information across a school group – perfect for MATs or local authorities. Reconciliation at school, year, class or pupil level. Our detailed reports include income type or specific account/cost codes, including individual payment transactions. ParentPay are certified PCI DSS Level 1 suppliers, so your payments are safe in our hands. A complete audit trail of all payments can be securely maintained. Transaction references and identifiers link parent and school accounts to the payment and banking network. We deliver strong compliance with security standards utilising end-to-end encryption from the client browser, right through to the bank. Our developers receive regular specialist security training to ensure the continued delivery of robust, secure and trusted source code. We manage data with agreement of the data controller (the school). We use safeguards around data handling and impose confidentiality requirements on our personnel. We will help schools meet the rights of the data subjects. Our security team manage and maintain our Information Security Management System. Our solutions have been audited with extensive technical and security due diligence by local authorities, central government departments and UK banks. ParentPay is integrated with all the leading management information systems; so if you’re part of a new trust or authority with different systems across the group, you can be sure ParentPay will still implement seamlessly.Reporting is fully configurable and integrates with finance and cashless systems to manage online payments efficiently. 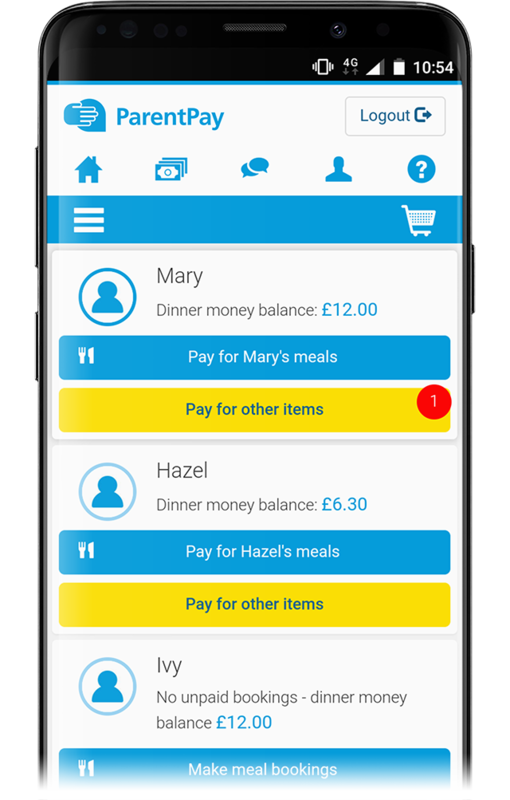 Whichever system you use, it will link with ParentPay to automatically collect payments, display balances and share meal selection with parents. If you work with a cashless system partner not listed, please contact us as we may still be able to integrate and provide a solution for you. We can arrange a demo online or over the phone. We may even be able to visit your school to show you the product in person. Face to face group training is available alongside detailed computer-based training, allowing staff to learn how to make the best of ParentPay at their own pace. We work closely with your finance, IT, audit and security staff to ensure implementation runs smoothly. Certified staff manage implementation across school groups with central contracts. Ongoing support from our experienced team. If you require additional training, we can provide extra on-site or online sessions.